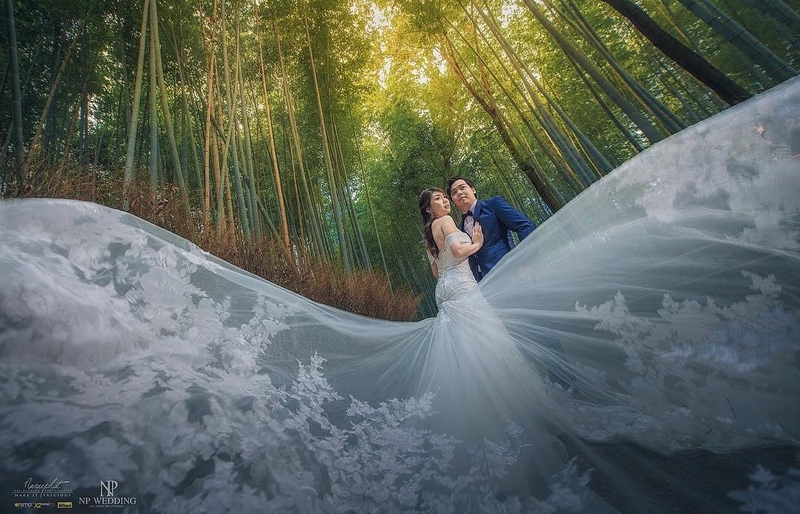 The shape of deep parabolic softboxes creates a unique quality of light that is highly coveted by portrait, fashion and beauty photographers. The parabolic design creates a broad column of soft, even light with definite direction. The inner 1-stop diffuser has a 2-stop center diffuser that eliminates the hotspot that is common with the parabolic design. This helps to create a soft light, even without the use of the outer diffuser. Removing the outer diffuser allows for even greater focus of the light and creates crisp, defined shadows while still maintaining the soft quality. 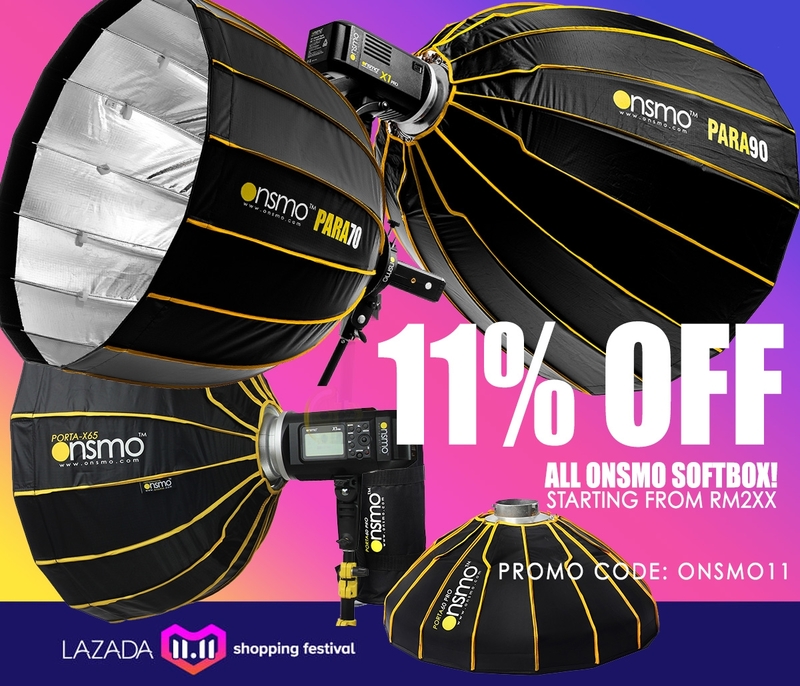 This small size deep parabolic softbox is ideal when portability is a priority and for soft headshots, macro work, or crisp full-body or hair- and accent lighting. The new line of deep parabolic softboxes comes in three different sizes depending on the photographers needs. These new modifiers are designed for everyday use in professional studios and were crafted to meet the demands of even the most stringent photographer. UMBRELLA internal mechanism to allow opening and closing in less than 5 seconds! UV-Coated diffusers, for more durability and to eliminate magenta color shift. The inner diffuser also features a 2-stop center spot to eliminate hotspots and further soften the light. Onsmo Ambassador Ray Loh with Onsmo Para 50! Naruephat (Onsmo Ambassador Thailand) using Onsmo Para 50 and X2 Mini for this output. 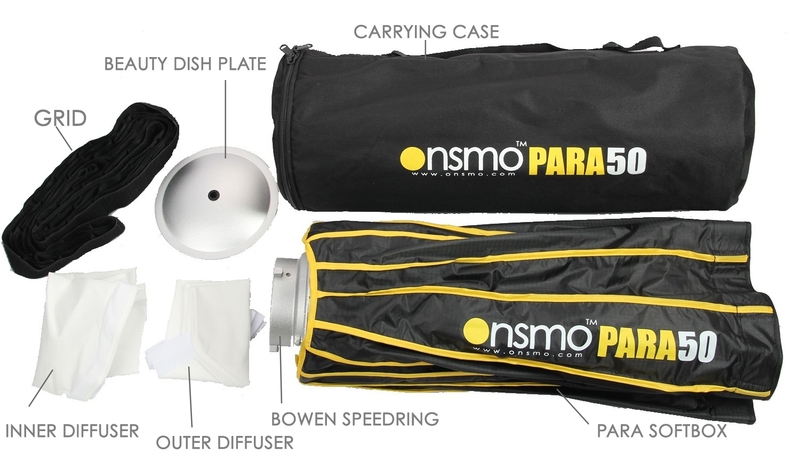 The Onsmo 50cm Deep Parabolic Soft Box works with Bowens mount lighting options (Profoto and Elinchrom mounts can be selected as well). It softens and helps shape the light output from flashes and studio lights. The deep, narrow shape creates sharp shadows and contrast, ideal for portraits, fashion, or commercial photography. The Soft Box’s inner surface has a highly reflective silver finish for sharp, direct light. There are also two diffuser panels included to modify and soften your lighting conditions as needed. 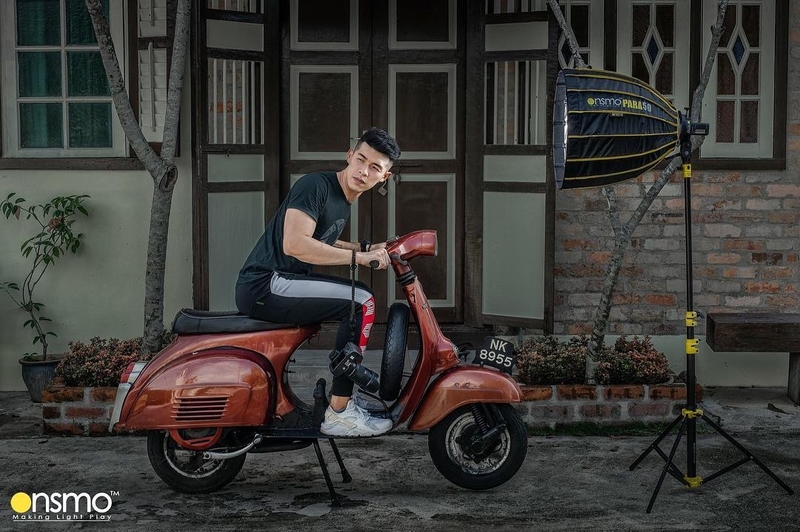 The Softbox is lightweight and folds down into the shape of an umbrella, making it incredibly easy to set up, or store and transport in its carry bag. The Parabolic Reflector Soft Box is heat resistant, able to withstand the heat generated by 650 watt lamps. The back of the softbox has a removable ventilation cover for further heat reduction. We've found that people really like to buy from BigbigStudio.com, and we'd love to make you a believer, too. Reputable authorized dealers adhere to MAP policies, which means the advertised price is typically the same price found at any authorized dealer. Sometimes products aren't included in said MAP policies, resulting in fluctuating prices across different websites. We absolutely want your business, so if you found a better price elsewhere on this item, let us know and we will attempt match our competitors price! We are eager to help you out. © 2009-2018 Bigbig Studio Equipment Malaysia. All Rights Reserved.